LA Garden Blog : Lots Goes On In A SoCal Garden in January! Rain on a broccoli, the photographer and his camera. We are grateful for the rain - even if it is just so-called 'negligible precipitation.' Lack of water is our plague and we need to garden in ways that keep moisture in the ground. These little showers are precious even if they aren't the be-all and end-all for us. One of the wonderful things of living in Southern California, this close to the Pacific Ocean is the delightful, mild weather we enjoy. This is both a blessing and a curse. Further inland and on almost all of the North American continent, 'gardening' this time of year means looking in the seed catalogs that have begun to fill your mailbox. If you aren't getting seed catalogs on a regular basis, you haven't been gardening a long enough – they will come like aphids to new growth. One of the truisms I try to practice is to 'garden with passion and gusto.' Gardening to me means growing it yourself from seed to final product and learning what works and how it works. At the beginning of the year, with all the promise of newness and resolutions, this is an exciting time for me in the garden. On days it isn't raining, the cool weather makes some of the more strenuous work a little less onerous and on warmer days it is usually not severe enough to make such work too difficult. So this is the time to do more than simply think about a general garden cleanup and get busy if you haven't done it already. It is still time to look after the plants of perennial food growing in your garden. If I haven't yet, I begin to prune my fruit trees. This is one of 'those jobs' I tend to procrastinate as long as I can. If you have no experience at fruit tree pruning, do your trees a favor and order a pruning handbook from University of California’s Agricultural and Natural Resources Division (ANR)1 or purchase a reputable pruning book. Remember that these trees will live a lot longer than a typical pet and we wouldn't treat our cats or dogs with the indifference many people show trees. Pruned correctly, an apple, plum or peach will produce luscious, tasty fruit for many years. It's actually harder on you (and the tree) to prune incorrectly, so find out how and do it as right as you can in the first place. There are very few 'professional' gardeners who actually know how to prune fruit trees. Some trees will only fruit on old wood and some only on newer wood. If you or the person you hire doesn't know this, you could ruin the tree for many seasons to come. Get someone who knows fruit trees and pay them or learn how to do it yourself! Make the cuts with clean and sharp tools and follow a few simple rules. This is the tail end of the 'dormant season' when one typically purchases deciduous fruit trees, apples, apricots, grapes and perennial ornamental plants such as roses. If you are putting perennial herbs in the ground (sage, rosemary and thyme – parsley is a biennial, with apologies to Paul Simon), this is the best time to put them in the ground – even though you may plant them year round here. Buy your trees or vines from someone who knows where you live in order to insure you are getting plants that will produce for you. A local neighborhood nursery will only carry plants that will do well in your climate whereas a big box outlet will carry things that are more likely to grow over a much wider area. You'll also find the selection at most big box stores to be woefully short and the staff indifferent, at best, to your needs. Mail order suppliers are excellent venues for purchasing trees. One of my best finds was from a mail order nursery. I called and talked to one of the staff asking a few questions. There is no replacement for a person with knowledge. Based on where I was gardening, he suggested I try my luck with Dorsett Gold apples. I took his suggestion and have been blessed with a delicious, sweet and crisp apple that has wowed visitors to the garden ever since. In the past, when pruning fruiting trees, without fail, I followed the pruning by spraying the tree with 'horticultural oil' which was what I was taught back in those days. Horticultural oil is highly refined petroleum oil that pests have never developed immunity to. It is deadly stuff. At one time, everyone was taught to spray this stuff whether you needed it or not on all your fruit trees to prevent future infestations. After doing this for a number of years, I opted to not spray. Guess what. Most of the time, I found I was wasting my time, labor and money on trees that did not develop problems in the following year. Well, what happens when you don't spray and the tree gets the ickies? Nothing really. Any insect you spray for is not going to kill your tree, it will, at worst deprive you of a crop, but not usually. If anything, you might get a smaller crop of apples or get apples with scab or some other non-fatal disease. The only disease that will kill your tree (fireblight) is not phased one iota by any spray. When I began to spray on as “only as needed basis,” I learned that more than 90% of the time I was merely throwing my money and time away. I don’t need to do that, do you? If you get a problem that needs spraying, read a different book. I'm done with spraying anything. Spraying has ramifications to honey bees – an insect we cannot do without. Simply not spraying for them, makes more sense than spraying for whatever prophylactic reason. Please consider not spraying at all. We are counting on our trees for food, so we will want to be proactive in their care, but we also need to be intelligent in our use of killing agents in our environment, and in particular around our food. Much of the problems we face in our world today are the result of mankind's irreverent and reckless use of “-icides” of all types and over using them 'just in case we might get an insect” instead of only if and when absolutely needed. Somehow, our culture has become convinced that warring with nature is a fight we can win. We are foolish when we spray “just because.” If you have pests, deal with them as the year goes along – and deal with them in ways that avoids all “-icides.” We can be a lot more intelligent in our dealings with the critters that compete for our food supply; spraying admits we have failed to deal with something in a more positive fashion. We were talking about pruning, right? So, on the other hand, all of your citrus fruit trees are evergreen and therefore can technically be pruned at any time of the year when they are not in flower or actually fruiting (some lemons you just have to look for a slow production time because stopping is not in their vocabulary). These trees are best pruned when there is nothing better to do and the day is not too warm, so the person doing the work doesn’t overheat. This may be a cold month and, if we are blessed, rainy. 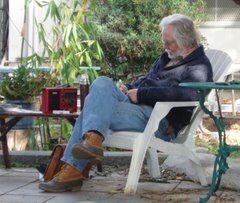 But we still have to keep our eyes out for Santa Ana winds – sometimes hot and sometimes cool, but always dry and desiccating to all garden plants, and plants in pots suffer even more. If your skin is crawling and you need more skin cream, or lip balm, you can bet your plants need more moisture too! It’s best to get out there with a hose and help your irrigation system keep up – you’ll enjoy your garden more – the “best fertilizer is the farmer’s shadow.” Still. Are you ready to think about summer yet? You mean you never stopped thinking about summer? If you are like me, you are completely overwhelmed with seed catalogs and drooling over their wonderful photos and the several hundred new mouth-watering, absolutely irresistible new varieties that all must be tried… in your one10’ square garden bed. If you aren’t getting these free catalogs, you haven't ordered from one yet. What have you been waiting for? Go to the list of seed houses (Appendix A) to make your day! Maybe your month! 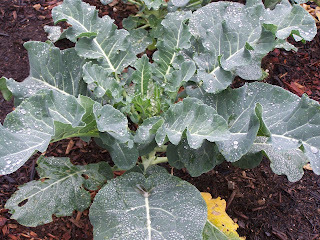 In the Garden, we are still putting out plants of broccoli and cabbage, chard and Brussel sprouts and we can still sow seeds of beets and carrots. Lettuce, the golden child of our winter gardens is the great hole-stopper – whenever any plant has to come out, have a six pack of lettuce on hand – preferably of different colors of lettuce – and plop one in the hole. One of my favorite tricks is to use red lettuces with green lettuces – or different shades of red and green to make a colorful food garden. Lettuce should be a top selection on everyone's list of border plants! Merveille des Quatre Saisons (about the only French I can say without sounding foolish, a marvelous red/green butter lettuce that performs well all through Fall to late Spring), next to Black Seeded Simpson (a very light green leafy lettuce) make a stunning color combo – but I also like Merlot, very dark wine red (aptly named!) alongside Black Seeded Simpson or Parris Island Cos, the quintessential Romaine lettuce. Color and shape, texture and form all come together in the lettuce patch – I swear I can't get through a seed catalog without ordering one or two more packets of lettuce seed. It is an addiction for me! The lettuce loves of my life right now are Merveille des Quatre Saisons, Black Seeded Simpson, Drunken Woman Frizzy Head (I'm not lying! ), Parris Island Cos, Red Yugoslavian, Rossa di Trento, Tango and Winter Density. All I have to do, however, is look through a new catalog and I'm easily swayed into the leaves of another. And as if all that wasn't enough, I even like homegrown head lettuce; it's not nearly the garbage found in stores – the ribs are thick and filled with water making a marvelous refreshing salad for a warm day. No one, no matter what kind of soil you have, should ever step into a garden bed. We want to keep the soil in these beds as fluffy and light as grandma's meringue (not my grandma! Some theoretical really-good-baking grandma!). Adding lots of organic matter will do that for you, but you must stay out of the beds – your footprints will ruin the 'fluffy' we are hoping for our roots. If you have clay soils, be especially careful to not step in your garden beds. Make paths around the beds and make the beds small enough to reach the center without stepping into the bed – if you have the opportunity to collect tree chips from an arbor company, collect as much of the stuff as you can use or keep to use. Spread it three or more inches deep wherever you have to walk while gardening. You will need to replenish this every so often, but you'll find it so helpful as it keeps weeds from growing in the paths near your garden beds and provides you with the opportunity to walk all around your garden beds without getting mud on your shoes no matter how wet the day! Under the top layer of mulch, the wood chips will be breaking down 'growing' really lovely soil through the years. Each chapter will have a chart like the one below. I indicate the months that are best for starting different vegetable seeds. “Start These in Containers” means you will plant the seeds in some kind of pot in a sheltered location (hopefully away from pests) to later “Move to the Ground from Containers.” The rest we start directly in the ground in the place they will grow to maturity. Some seeds can be done either way and, if that's the case, I will usually do both. The ones started in containers and moved to the garden will often mature later than the ones started in situ. This way you have two different harvest times if all goes well, but if not, the different strategies may pay off if one of the plantings gets hammered by a weather event or insects. Chard should be in abundance right now and that often leads to 'chard overload,' how many times can you steam chard and hit it with lemon juice and still wolf it down with glee? I'm limited but this recipe never seems to fail to satisfy. The ingredient list only looks daunting. Most of that list is simply a plethora of spices and you will find you already have a lot of them and need to use them up sooner rather than later. I have made this missing a spice here and there and missing raisins (don't make it without raisins if you can help it they really add a delightful sweetness). It doesn't take long to make and the flavors run the gamut from sweet to savory and it is a delightful mélange. Serve with rice or quinoa for a satisfying vegetarian dinner. Be sure to stir every 3-5 minutes to ensure that the bottom does not burn and that your ingredients are evenly combined. You can add a tablespoon of rice flour if you like your stew thicker. Remove from the heat after 20 minutes. Serve with rice or quinoa.